some snow showers....that darn Ground Hog lied!! 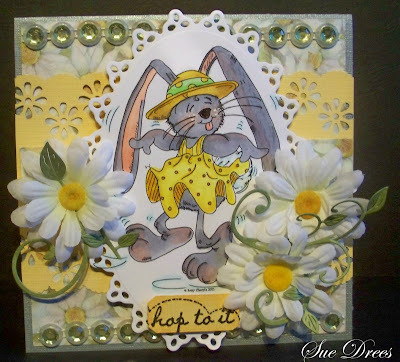 Today's card is for the challenge at Sassy Cheryl's #158 Fancy Edges. 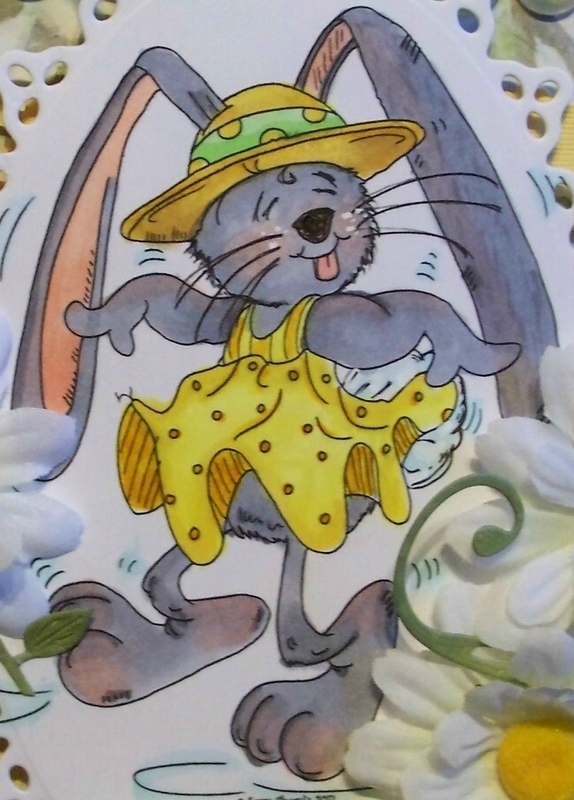 This is a digi by Cheryl called Dancing Bunny. Isn't she cute!! Paper - Gray, yellow and white textured card stock. Daisy designer paper K & Co.
Oh I love that cute image! Beautiful card! Great job! 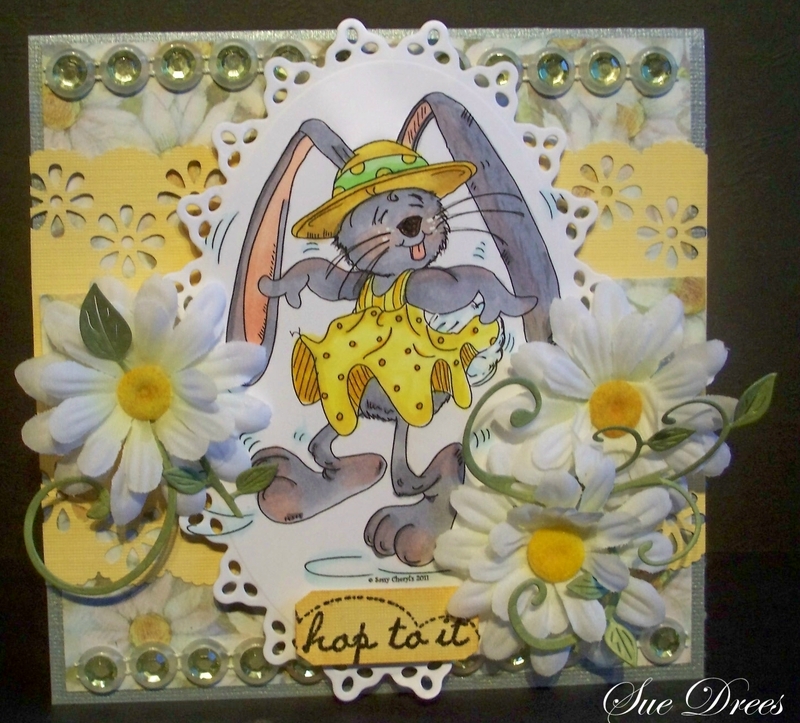 What a super image,the bunny is delightful and your card is fabulous! Good morning from Germany Sue! Here it's also still cold and snowy. :-( I so love your little bunny! :-) I love the lop ears, it really reminds me of my little pet bunny Bummy, who was a lop eared bunny. :-) I still miss her much so I always smile when I see things of lop eared bunnies. I hear ya on the wintery weather. I thought they were calling for rain today and when I pulled up the shades after my shower it was snowing. What's up with that?!!?!? Come on spring. Hopefully this little cutie of a card will get the weather in the mood. Love it. Very sweet and great coloring! ooo what a cute one Sue, such a lovely card. Hi Sue, it is beautiful here in Arizona (80-90 degrees) but back home in Manitoba it is awful! They just had a big snowfall & it is cold, cold, cold! Glad I won't be home for about another month! Your card is adorable...I love that bunny! Have to hop over to Sassy Cheryl's & check it out! Super sweet, love those daisies and the colour scheme is fab! Thanks for joining us this week over at LRW. What a great card. Thanks so much for sharing your project with us at CTO! they are saying a bit of snow and cold for us too! Your card is awesome, I love your wonerful coloring, and your design is eye catching! Fantastic coloring, so many lovely details, I wouldn't change a thing on this card. Thank you for joining us at the Celebrate the Occasion challenge and hope to see you back again. Oh Sue this is darling. I love those daisies and swirls. Your yellow and gray bunny is just precious. Rain here today and lots of if. Guess that is better than your snow. Hang in there, Spring is coming. Awh, Sue, a breath of spring! This is adorable! Love it! Thank you for joining us this week for the Sassy Cheryl's challenge!